Twins Jack and Jaide are Troubletwisters, training to take on the position of Warden. Wardens maintain the wards that protect the world from The Evil, an entity from an alternate dimension that is seeking to take over the earth. Jack and Jaide are still learning how to control the special Gifts they have that will allow them to eventually take on their role guarding the wards. Their inexperience doesn’t stop their father, also a Warden, from giving them a mission to find the mysterious Golden Card of Translocation at Rourke Castle. The twins must overcome many dangers and challenges, including their own unpredictable Gifts, to find the treasure before The Evil does. They must navigate secret passages, talking parrots and animated suits of armour, while trying to work out who they can trust. Will they find the Golden Card in time? This is the third book in the Troubletwisters series, written by Australian authors Garth Nix and Sean Williams. I read this book without having read the first two books in the series and was quickly able to pick up enough of the back story to understand what was happening. The prologue to the story is quite menacing and there is a sinister air to the story at times, with The Evil a very real and threatening presence. Parents of children at the younger end of the recommended age range might like to look over the story themselves first before handing the books to their children. It is possible to download sample chapters of each book from the Trouble Twisters website. 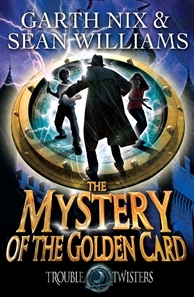 The Mystery of the Golden Card is an exciting adventure story with mystical elements. The characters are interesting and the story has many unexpected twists that keep readers on the edge of their seat. Older children who enjoy the Troubletwisters books might also like Garth Nix’s Keys to the Kingdom series, aimed at children aged 10 – 15.